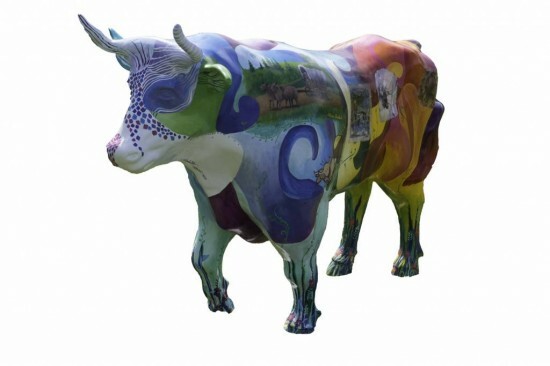 The concept that evolved was to paint a dramatic and elegant background of gently merging colors in organic fluid shapes, that would include grasses and wildflowers on the hooves and up the legs, and then include the words: “An ancient and rich history of service to humankind...” on one side. Once I had that much of the idea set, I then I invited eight other women artists, professional artists all (with the exception of one student) but all with strong drawing skills, to join me by selecting one aspect in the ox’s “ancient and rich history of service to humankind” which I had researched, found source photos, and listed for them, requesting that they develop imagery appropriate to that concept that would become an approximately 8”x10” ‘vignette.’ Each woman artist was encouraged to use their own distinct artistic style and clearly sign their vignette. These were to be arranged over the entire body of the ox. Our hope was to create something visually stunning as well as informative.